Recently, while on retreat, I came across a rocky headland where a wide variety of plants was struggling with grim determination to grow. 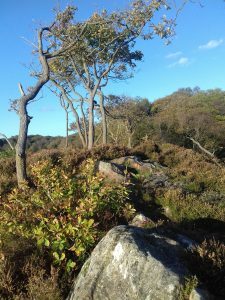 Grass, heather and trees all struggled to thrive in the rocky soil. Not in their natural environment, deprived of good soil, they were undernourished, stunted and vulnerable. Not unlike a few mission workers I know! Mission takes nearly all of us out of our normal environment. It also takes us to a context where we may find it hard to thrive. Sometimes we are isolated (emotionally, spiritually, culturally, physically) with little encouragement, fellowship or input. This is why Syzygy started publishing devotional blogs, so that we can help to provide a little input into the lives of isolated mission workers. If the plants I mentioned above were in my care, I might consider moving them to a new location where they are more suited to the growing conditions. While some of us may be aware that we are called to endure in tough places, others may be wondering if we’ve made the right choice. And there’s no shame in relocating to a place where we can thrive better if we feel that’s the right choice before God. After all, if our life is more shrivelled up and stunted than it is abundant (John 10:10) it would be good for us to reflect on how positive our Christian witness is likely to be. Alternatively I might try to change the growing conditions of the plants I were caring for. I’m a great believer in manure and (although we might joke that most of our agencies are good at giving us that) like plants we need to make sure that we get sufficient nutrition to thrive. Eating well is obviously an important part of staying healthy, but we also need to make sure that emotionally and spiritually we are taking in more than we give out. Where are the supportive relationships we need? Is social media sufficient, or do we need to arrange for more team members to join us in our location? Are we able to sustain ourselves from our own private Bible study or do we need to access podcasts, books and commentaries? Do we need to schedule more time away from the mission field in order to recharge our batteries effectively, or make plans for more retreat? When looking at struggling plants on that rocky headland, while having sympathy for their challenge, I also felt huge admiration for their tenacity. Being plants they obviously had no means of simply moving to a location more conducive for growth, so they just stubbornly got on with it. Like many of the mission workers I know. Like it says in Matthew, those who hang on by the skin of their teeth will be saved (Matthew 24:13). If you’re in that situation, we salute your tenacity. Keep on keeping on!